I found a praying mantis in my backyard last week and took some pictures, fascinated by its size and a head that turns 180 degrees, but it was still kind of pretty except for all those tiny razor blades on its front legs. But as big as it was, it moved slowly so I had no fear… not until the “incident.” After I took my pictures, I stayed in the backyard for an hour or so, then went inside and cooked dinner. After dinner my husband went out with some friends and I drove to the mall. It was dark. As I was pulling in to a parking spot, I felt something on my left hand, grabbing my finger and biting or sticking me with something. I panicked because it was dark and I couldn’t see what it was. I shook my left hand but I still couldn’t see what it was. A spider? A scorpion? I jumped out of the car while it was still running and the interior light came on and I saw it… a praying mantis on my steering wheel. And it was huge! I didn’t know what to do. I grabbed a kleenex from my purse but he looked bigger than the kleenex. I knew I had to act. I was trying to work up my nerve to grab him with the tissue when he suddenly dropped to the floor where there was no light. I ran around to get a flashlight out of my glove box, came back and shone the light but he was gone. But where? Somewhere in my car. Even if I found him I wouldn’t know what to do. Maybe it was time to sell the car. I called my husband and said I will not get back in the car so he came and let me drive his car home and he drove mine (my hero ❤️). Once in our garage with lots of light, he was unable to find the intruder. I cut some leaves off a shrub and placed them inside my car overnight hoping it would coax him out but the next morning he was still missing. Maybe he got out? Maybe he’s waiting for me to drive again so he can crawl on the back of my neck while I’m on the freeway. Click these pictures I found online to get a good look! For the next couple of days we kept checking with flashlights and we never saw him. I was too scared to drive anywhere. By the third day we still didn’t see him but we did hear something… a scratching noise coming from inside the air conditioning vent right by the steering wheel. (It’s coming from inside the car!) The good news: We found him. The bad news: He can’t get out. He’s been there for days. Or maybe he CAN get out and is just resting. What if he crawls out while I’m driving? We took the car to three mechanics who said there’s nothing they can do without taking the whole dashboard apart so I should just let him die in there. 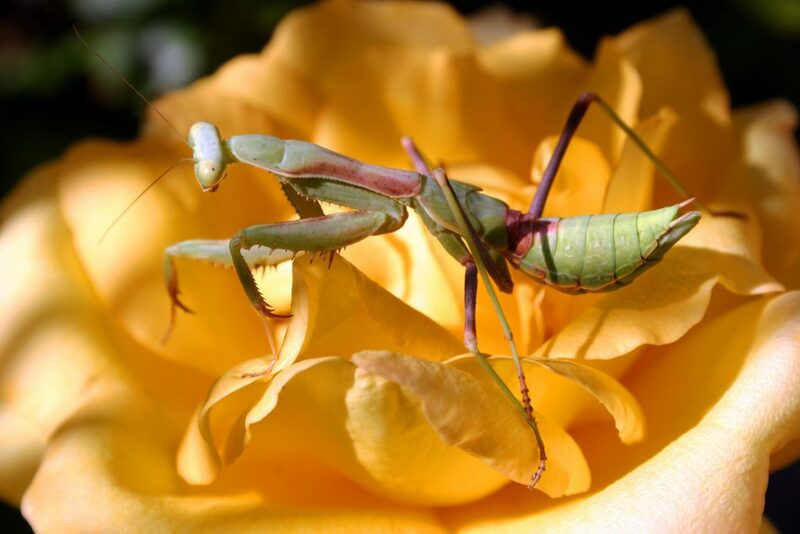 I looked up how long a praying mantis can live without food – TWO WEEKS! He must have hitched a ride on me when I was outside. But why didn’t he go after my salad? I spent ten minutes making a salad, and then ten minutes eating it. Where was he then? On my back? He must have been on me for two hours while I cooked and ate dinner, cleaned up the kitchen, and drove to the mall. I would like to go out today but it’s hot and I would need to run the air conditioning. What if he tries to get out while I’m driving and see I those bulging zombie eyes looking at me through the vent? I’d like to sell the car, with a praying mantis discount of course. Otherwise, to drive I need to arm myself… maybe drive with a fly swatter or an oven glove or a box of cats?? ?